Objective To compare the effectiveness of elective single embryo transfer versus double embryo transfer on the outcomes of live birth, multiple live birth, miscarriage, preterm birth, term singleton birth, and low birth weight after fresh embryo transfer, and on the outcomes of cumulative live birth and multiple live birth after fresh and frozen embryo transfers. Design One stage meta-analysis of individual patient data. Data sources A systematic review of English and non-English articles from Medline, Embase, and the Cochrane Central Register of Controlled Trials (up to 2008). Additional studies were identified by contact with clinical experts and searches of bibliographies of all relevant primary articles. Search terms included embryo transfer, randomised controlled trial, controlled clinical trial, single embryo transfer, and double embryo transfer. Review methods Comparisons of the clinical effectiveness of cleavage stage (day 2 or 3) elective single versus double embryo transfer after fresh or frozen in vitro fertilisation (IVF) or intracytoplasmic sperm injection (ICSI) treatments were included. Trials were included if the intervention differed only in terms of the intended number of embryos to be transferred. Trials that involved only blastocyst (day five) transfers were excluded. Results Individual patient data were received for every patient recruited to all eight eligible trials (n=1367). A total of 683 and 684 women randomised to the single and double embryo transfer arms, respectively, were included in the analysis. Baseline characteristics in the two groups were comparable. The overall live birth rate in a fresh IVF cycle was lower after single (181/683, 27%) than double embryo transfer (285/683, 42%) (adjusted odds ratio 0.50, 95% confidence interval 0.39 to 0.63), as was the multiple birth rate (3/181 (2%) v 84/285 (29%)) (0.04, 0.01 to 0.12). An additional frozen single embryo transfer, however, resulted in a cumulative live birth rate not significantly lower than the rate after one fresh double embryo transfer (132/350 (38%) v 149/353 (42%) (0.85, 0.62 to 1.15), with a minimal cumulative risk of multiple birth (1/132 (1%) v 47/149 (32%)). The odds of a term singleton birth (that is, over 37 weeks) after elective single embryo transfer was almost five times higher than the odds after double embryo transfer (4.93, 2.98 to 8.18). Conclusions Elective single embryo transfer results in a higher chance of delivering a term singleton live birth compared with double embryo transfer. Although this strategy yields a lower pregnancy rate than a double embryo transfer in a fresh IVF cycle, this difference is almost completely overcome by an additional frozen single embryo transfer cycle. The multiple pregnancy rate after elective single embryo transfer is comparable with that observed in spontaneous pregnancies. Meta-analysis of individual patient data has several advantages over a traditional review of published data,12 including the ability to carry out data checks, standardise outcome measures, and perform appropriate subgroup analyses.13 We carried out a systematic review of randomised controlled trials to compare the effectiveness of cleavage stage (day 2 or 3) elective single versus double embryo transfer on the outcomes of live birth and multiple live birth after a fresh embryo transfer and on the outcomes of cumulative live birth and multiple live birth after fresh and frozen embryo transfers. Our use of individual patient data allowed us to address some of the acknowledged shortcomings of existing meta-analyses of aggregated data, including assessment of study quality, intention to treat analysis of all randomised women, and subgroup analysis based on important prognosticators such as age, duration of infertility, and embryo quality. In addition, we used the combined dataset of randomised women to investigate key outcomes such as term singleton live birth, miscarriage, and preterm birth not previously reported by the relevant trials. We searched Medline and Embase databases up to 2008 using relevant terms and word variants for the interventions and study design. The detailed search strategy is in appendix 1 on bmj.com. We also hand searched bibliographies of all relevant primary articles and reviews to identify any articles missed by the electronic searches. Several trial registers were searched to identify ongoing trials and experts were contacted to identify further studies. No language restriction was applied. Studies were selected in a two step process. We first scrutinised the citations identified by the electronic searches and then obtained full manuscripts of all the citations that met or were thought likely to meet the predetermined inclusion criteria based on criteria for patients at entry, type of intervention, and study design. Only randomised controlled trials that compared the clinical effectiveness of cleavage stage elective single with double embryo transfer were deemed eligible for inclusion. Quasi-randomised trials were excluded, as were trials with other co-interventions. Ongoing trials and crossover trials were considered for inclusion—the latter only if data from before the crossover occurred were available. Women undergoing IVF or intracytoplasmic sperm injection, or both, with their own oocytes were considered eligible for inclusion. We included comparisons of the clinical effectiveness of elective single versus double cleavage stage embryo transfer after fresh or frozen IVF or intracytoplasmic sperm injection treatments. Frozen treatment cycles were included if the intention was to follow the randomised allocation of electively transferring one or two embryos. Trials that involved only blastocyst (day five) transfers were excluded because of their higher success rates,19 which could lead to biased results. Trials were included if the intervention differed only in terms of the intended number of embryos to be transferred—that is, similar protocols were used for controlled ovarian stimulation, embryo culture, and the replacement of embryos. The primary outcomes were live births and multiple live births after the initial fresh embryo transfer, cumulative live births, and cumulative multiple live births (after fresh and frozen embryo transfers accruing from a single oocyte retrieval). Secondary outcomes included miscarriage rate and perinatal events such as rates of preterm delivery, term singleton delivery, and delivery of at least one low birthweight baby (<2500 g). The denominator for miscarriage rate was defined by using all pregnancies, including biochemical pregnancy. We sought individual patient data from all identified eligible trials. Every attempt was made to contact the corresponding authors of published and registered trials via post, email, or telephone to access data. Authors were supplied with a data extraction sheet and asked to supply anonymised data for every patient in the trial in a password protected or encrypted database. Received data were merged into a specifically constructed master database. The data were subjected to standard range and internal consistency checks. In addition, the results from the review’s analysis were cross checked against the published reports of the trials. Authors were contacted for clarification where discrepancies existed and asked to supply missing data when possible. From each trial we extracted information on the characteristics of the couples (body mass index (BMI), woman’s age, duration, type and cause of infertility, and type of treatment); the characteristics of the cycles (randomised treatment (elective single embryo transfer or double embryo transfer), number of embryos available for transfer, day of transfer, and number of blastomeres); the type of outcome (live birth, multiple live birth, cumulative live birth, cumulative multiple live birth, miscarriage, preterm delivery, term singleton birth, and low birth weight). To ascertain validity, we assessed all selected trials for their methodological quality on the basis of information reported in the original published papers, trial protocols (for non-published trials), and responses to specific queries to the authors. Study quality was scrutinised by checking the adequacy of randomisation, comparability of groups at baseline (examining baseline characteristics for any substantive differences), the use of blinding (where appropriate), the use of intention to treat analysis, the completeness of follow-up, reliability with a priori sample size estimation, and generalisability with a description of the sample recruited. The adequacy of randomisation was assessed by exploring methods used for sequence generation, treatment allocation, and allocation concealment. When these details were unclear in the initial publication, we contacted authors to provide further clarification. Receipt of data from each trial was followed by checks to ensure the accuracy of the data, integrity of randomisation, and the extent of follow-up. Standard range and internal consistency checks were used to assess accuracy. Final analyses were based on all patients randomised with the intention to treat principle, and the data were checked to confirm that no patients were excluded after trial entry and that key prognostic variables were similar in the randomised groups. Queries were resolved in discussion with the relevant trialists, who received results based on re-analysis of their original trial data. We carried out formal checks for statistical heterogeneity between the trials by summarising randomised treatment effects for each trial using odds ratios obtained from the individual patient data. The I2 statistic was applied to these summary data to describe the percentage of variation across trials caused by heterogeneity, as opposed to sampling error. A value greater than 50% was considered to show substantial heterogeneity.20 To assess the risk of bias across trials, we used funnel plots and formally assessed their symmetry using the Horbold-Egger test. We included any of the above covariates with P<0.3 in a backward stepwise logistic regression modelling procedure to determine multiple covariates that, together, had a significant effect on the outcome, while holding the trial and elective single versus double embryo transfer effects fixed. A similar process was performed for the other primary and secondary outcomes. The odds ratios and their 95% confidence intervals of all outcomes were calculated from the models based on the intention to treat principle. In the presence of substantial heterogeneity between trials or over-fitting because of small numbers in each trial, we performed sensitivity analyses by excluding the offending trial(s). We fitted further logistic regression models to investigate the effect of single versus double embryo transfer on live births and multiple live births between different subgroups of women. 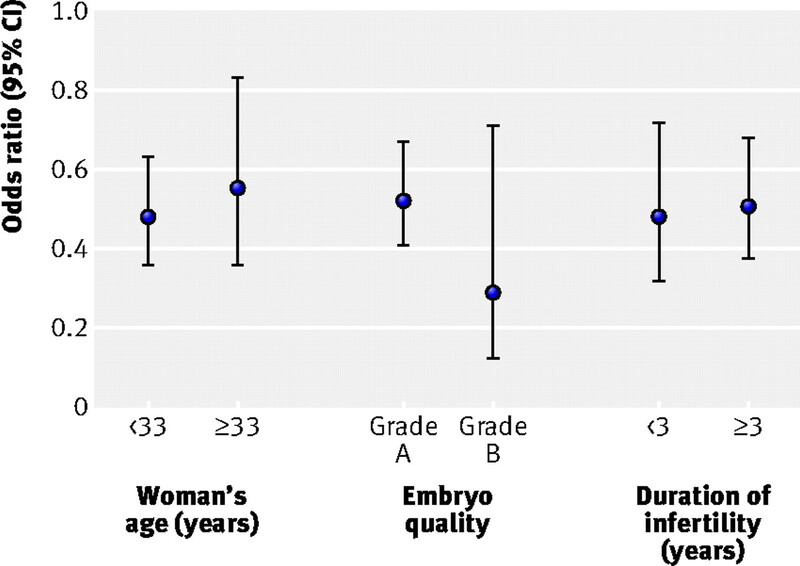 The subgroups were woman’s age (<33 and ≥33), duration of infertility (<3 and ≥3 years), and embryo quality (grade A and B). Subgroups were coded as binary factors and included in the model along with trial and single versus double embryo transfer. To investigate whether the effect of single versus double embryo transfer on live birth differed among the subgroups, we added an interaction term to the model of single versus double embryo transfer by subgroup factor. In addition, for singleton live births only, we compared birth weight between single versus double embryo transfer using a linear regression model adjusted for trial. Because of the small percentage of missing data, all analyses were undertaken with complete data only. We used Review Manager (RevMan) v5.0 (Nordic Cochrane Centre, Cochrane Collaboration, Copenhagen) and SAS v9.1 (SAS Institute, Cary, USA) for statistical analyses. Electronic searches identified 1539 citations, from which we assessed 11 full text articles for eligibility. Three of these trials were excluded for different reasons23 24 25 (table 1⇓). Eight trials were considered to be suitable for inclusion in the review (fig 1⇓). Three were unpublished trials.9 10 One was a pilot trial, which was published only as part of a PhD dissertation.9 The other two were externally funded national trials, in Australia (National Health and Medical Research Council Grant no: 158006) (M Davies, University of Adelaide, personal communication) and the UK.10 The Australian trial, known as the “Australian study of single embryo transfer (ASSET),” was stopped because its implementation immediately and substantially altered patients’ decision making, which more than tripled the rates of elective single embryo transfer during the study period and reduced participation rates (M Davies, University of Adelaide, personal communication). The UK trial, known as the “efficacy and cost effectiveness of selective single embryo transfer (ECOSSE) study” was stopped because of poor recruitment. As entry criteria were slightly different among trials, we could not exclude an element of clinical heterogeneity. With the exception of two trials,9 28 all the trials included women with “good prognoses”—that is, younger women in their first or second IVF treatment cycles with good embryo quality. The age criteria were different in the eight included studies. The upper age limit was 34, 35, and 36, respectively, in Gerris et al,29 Lukassen et al,27 and Thurin et al.26 In a multicentre Finnish trial, one of the centres did not take the age of the woman into account, but the other centres included only women aged under 36 in their first treatment cycle.30 There was no upper age limit for entry into van Montfoort et al28 or Thurin,9 while the upper age limits for Davies and Bhattacharya were 35 and 37, respectively.10 All trials included women with good quality embryos, apart from one that included women with at least two normally fertilised oocytes.28 Criteria for embryo quality differed in the individual trials but generally involved visual morphological assessment, in addition to the number of blastomeres. Ovarian stimulation protocols and oocyte retrieval, embryo culture, and embryo transfer techniques varied slightly among the different trials. Though nearly all trials involved only cleavage stage transfers, one published and one unpublished study included a few blastocyst (day five) transfers,9 26 which we excluded from the analysis because of small numbers. Individual patient data were received for every patient recruited to all eight eligible trials (n=1367). The received data had varying levels of completeness (see appendix 2 on bmj.com). With the exception of BMI, which was missing for nearly 17%, all required variables were over 95% complete. The methodological quality of the included studies varied (table 2⇓). Three of the published trials26 27 30 and all three unpublished trials (M Davies, University of Adelaide, personal communication)9 10 explicitly mentioned computer generated randomisation. One trial used a non-transparent box containing sealed opaque envelopes,28 and one trial did not mention details of the method of randomisation used.29 The first author of the latter trial, however, later confirmed that randomisation was performed at the time of embryo transfer by laboratory staff using a computer generated randomisation list (J Gerris, personal communication). Four studies performed intention to treat analysis.9 26 27 28 Although not explicitly mentioned in the original publication, the first authors of two trials29 30 later confirmed that they had performed intention to treat analysis. Only one of the published studies was double blinded—that is, neither the patient nor the physician knew whether one embryo or two embryos had been transferred.26 Two unpublished trials used double blinding at the time of embryo transfer.9 10 Davies et al enforced double blinding at the time of embryo transfer, but the participants were unblinded when they received photographs of the transferred embryo(s) (M Davies, University of Adelaide, personal communication). In one study only the patients were blinded, but they were told immediately after the transfer whether they received single or double embryo transfer.28 Other trials were not blinded. Thurin et al,26 Lukassen et al,27 and van Montfoort et al28 reported an a priori power calculation; Gerris et al29 and Martikainen et al30 did not. Appendix 3 on bmj.com shows characteristics of the women by trial. Before conducting the analysis of individual patient data, we carried out an aggregated meta-analysis of the individual trials to check for heterogeneity (fig 2⇓). The pooled odds ratio for elective single embryo transfer versus double embryo transfer was 0.50 (95% confidence interval 0.40 to 0.63) for live births and 0.07 (0.03 to 0.17) for multiple live births. The I2 statistic was 0% for both outcomes, suggesting no significant heterogeneity between trials and therefore justified the analysis of individual patient data. The Horbold-Egger test result was not significant for both outcomes, suggesting no significant publication bias. The two randomised groups of women were comparable in terms of baseline characteristics (table 3⇓). In the women, the mean age was 31.3 (SD 3.5) in the single embryo transfer group and 31.4 (SD 3.4) in the double embryo transfer group, and the median BMI was 23.3 (interquartile range 21.3-26.1) and 23.3 (21.1-26.3), respectively. The most common cause of infertility was male factor infertility (41% and 40%, respectively). Table 4 summarises details of treatment in the fresh cycle.⇓ In both groups the median number of embryos available was five, and most embryo transfers were performed on day two (79% in both groups). The allocated treatment was received by 677/683 (99%) patients in the elective single embryo transfer arm and 676/684 (99%) patients in the double embryo transfer arm. Only one (0.1%) woman was lost to follow-up (in the double embryo transfer group). Thus 683 women in the elective single embryo transfer arm and 683 in the double embryo transfer arm were included in the analysis of primary outcomes. After one fresh cycle, the live birth rate in the elective single embryo transfer group (181/683, 27%) was lower than in the double embryo transfer group (285/683, 42%). The odds of a live birth in women randomised to single embryo transfer were half that for women who received a double embryo transfer (table 5⇓). When we did a backward stepwise selection process, the adjusted odds ratio remained similar (adjusted odds ratio 0.50, 95% confidence interval 0.39 to 0.63). A few women 72/1366 (5%) were excluded from this adjusted analysis because of missing values for the covariates. The covariates that were included in this adjusted model were the grade of the embryos transferred, type of treatment, and the primary cause of infertility. The odds of live birth associated with transfer of grade A embryos were significantly higher than for grade B embryos (1.99, 1.26 to 3.13; P=0.003) (table 5).⇓ The chance of a live birth was 66% greater after IVF than after intracytoplasmic sperm injection (1.66, 1.15 to 2.38; P=0.006). Compared with male infertility, female infertility was associated with a reduction in the odds of a live birth (0.58, 0.38 to 0.88; P=0.02). Fewer multiple births occurred after one elective single embryo transfer cycle (3/181, 2%) than after a double embryo transfer cycle (84/285, 29%) with an odds ratio of 0.04 (0.01 to 0.12; P<0.001). No other covariates had a significant effect on multiple live births. Only two trials had an additional frozen single embryo transfer after the initial fresh elective single embryo transfer (both Thurin trials). This resulted in a cumulative live birth rate similar to that after one fresh double embryo transfer (132/350 (38%) v 149/353 (42%); 0.85, 0.62 to 1.15), with a minimal cumulative risk of multiple live birth (1/132 (1%) v 47/149 (32%); 0.02, 0.002 to 0.12). The rate of miscarriage in the elective single embryo transfer group (60/245, 24%) was higher than in the double embryo transfer group (63/355, 18%), with an odds ratio of 1.52 (1.01 to 2.28). There was, however, evidence of significant heterogeneity between the trials. When we excluded the two trials that caused the heterogeneity (Davies, 2003; Thurin, 2005) the odds ratio remained similar (1.51, 0.99 to 2.33; P=0.06). We excluded five (0.4%) women from analysis because of missing data on age. Younger women (<33) had a higher odds of a live birth than older women (≥33) (336/915 (37%) v 130/446 (29%); 1.37, 1.05 to 1.77; P=0.02). As before, the odds of a live birth in women randomised to elective single embryo transfer were half those for women who received a double embryo transfer (0.50, 0.40 to 0.63; P<0.001). The effect of elective single embryo transfer versus double embryo transfer on live birth did not differ between younger (131/461 (28%) v 205/454 (45%)) and older (50/219 (23%) v 80/227 (35%); P=0.60) women. Figure 3 shows the odds ratios for both groups by age ⇓. There was no difference between the odds of multiple live birth for younger versus older women (64/336 (19%) v 23/130 (18%); 1.06, 0.58 to 1.91; P=0.86). As before, the odds of a multiple live birth in women randomised to elective single embryo transfer were significantly smaller than for women who received double embryo transfer (0.04, 0.01 to 0.12; P<0.001). The interaction between elective single versus double embryo transfer and age group could not be fitted in the model as no multiple births occurred in women aged over 32 who received elective single embryo transfer. The rate of multiple live births for elective single versus double embryo transfer, however, were similar for younger women (3/131 (2%) v 61/205 (30%)) and older women (0/50 v 23/80 (29%)). For embryo grade and duration of infertility subgroup analyses, the odds ratios for elective single versus double embryo transfer were similar to those reported for age group. There was no difference between the odds of multiple live birth for grade A embryos versus grade B embryos (4/27 (15%) v 81/423 (19%); 1.59, 0.49 to 5.17; P=0.44). We could not fit the interaction between elective single versus double embryo transfer and embryo grade in the model because no multiples occurred in women randomised to elective single embryo transfer who had grade B embryos transferred. The rate of multiple live births for elective single versus double embryo transfer, however, were similar for grade A (3/164 (2%) v 78/259 (30%)) and grade B (0/10 v 4/17 (24%)) embryos. Couples with three or more years of infertility had the same chance of multiple births as couples who experienced less than three years’ infertility (28/153 (18%) v 56/298 (19%); 0.97 (0.55 to 1.72), P=0.91). The effect of elective single versus double embryo transfer on multiple live birth did not differ between shorter term (1/60 (2%) v 27/93 (29%)) and longer term (2/115 (2%) v 54/183 (30%)) duration of infertility (p=0.95). For couples with under three year’s infertility, the odds ratio for multiple live birth rates for eSET versus DET was 0.04 (0.005 to 0.29). In couples who were infertile for three years or more, the odds ratio was similar (0.04, 0.01 to 0.17). Table 6 shows perinatal outcomes after elective single versus double embryo transfer⇓. One woman had missing values for all perinatal outcomes and was excluded from this analysis. The odds of delivering at least one low birthweight (<2500 g) baby after elective single embryo transfer were a quarter of those associated with double embryo transfer (table 6).⇑ After adjustment for gestational age, this odds ratio rose, only slightly, to a third. For singletons born after elective single or double embryo transfer, the mean birth weights were 3373 g (SD 591 g) and 3275 g (SD 773 g), respectively, and there was no significant difference between them (P=0.18). Elective single embryo transfer was associated with a significantly reduced risk of preterm birth at ≤37 completed weeks, with an odds ratio of 0.33 (0.20 to 0.55). The odds of preterm births at ≤34 completed weeks for elective single versus double embryo transfer were similar to that for preterm births at ≤37 completed weeks (table 6).⇑ Increasing maternal age significantly reduced the odds of a preterm birth at ≤34 completed weeks (adjusted odds ratio 0.86, 0.77 to 0.97). For very preterm births (≤32 weeks) covariates affecting the odds of this outcome included double embryo transfer, higher female BMI, and longer duration of infertility. For each unit increase in BMI, the odds of a preterm birth at ≤32 weeks increased by 16% (1.16, 1.04 to 1.30; P=0.01), and for each yearly increase in duration of infertility the odds of a preterm birth increased by 52% (1.52, 1.15 to 2.03; P=0.004). Term singleton live birth rates after a single fresh cycle of elective single embryo transfer are higher than those associated with double embryo transfer. Compared with double embryo transfer, elective single embryo transfer has a significantly lower risk of preterm birth and delivery of a low birthweight baby. As previously reported in systematic reviews based on aggregated data, elective single embryo transfer in a fresh IVF cycle yields a lower live birth rate than double embryo transfer,8 but this difference is almost completely overcome by an additional fresh or frozen single embryo transfer cycle. The multiple live birth rate after elective single embryo transfer is much lower than that associated with double embryo transfer and comparable with that observed in spontaneous pregnancies. We obtained individual patient data from all eligible trials of cleavage stage elective single versus double embryo transfer in IVF; the overall quality of received data was good and there were few missing values. The quality of the included studies was variable, with some of the earlier papers failing to report key details such as mechanism of randomisation, intention to treat analysis, and a priori power calculation. We subsequently obtained information about these factors by directly communicating with the authors who were part of the collaborative group. These responses suggest that the source of error lay in reporting rather than faulty design. Information regarding the quality of the three unpublished studies was obtained from trial protocols and personal communication with the trialists. These trials had limited sample size (n=93 in total) compared with the published trials, and two of the three were stopped because of poor recruitment. Their inclusion is important, however, as they alleviate systematic bias.31 Detailed information on trial quality allowed us to be strict in our inclusion criteria of potential trials. While this type of meta-analysis is more demanding in terms of resources, time, and cooperation than meta-analysis of aggregated patient data,32 there are many benefits. These include the ability to perform consistent data checks and cleaning, having a complete database to analyse all the relevant variables from all relevant trials, the ability to analyse effects at patient level, and collaboration with all the trialists.18 An alternative method to the one stage meta-analysis of individual patient data done in this study could have been the two stage procedure, where each study is analysed separately and the summary estimates combined in an aggregated meta-analysis. We chose the one stage approach because all individual patient data were available from all eight trials, and this allowed for the adjustment of potential confounding factors and the exploration of treatment effects and subgroup interactions. This study confirms earlier results from aggregated systematic reviews that in a fresh IVF treatment cycle, elective single embryo transfer is associated with a reduced chance of live birth compared with double embryo transfer but that the additional transfer of another frozen single embryo in a successive cycle results in a comparable live birth rate and virtually eliminates the risk of twins.8 33 In the relatively homogeneous population of women who were recruited to these trials (that is, younger women with good quality embryos) elective single embryo transfer in a fresh cycle resulted in lower rates of live birth than double embryo transfer, irrespective of the age of the woman, duration of infertility, and embryo quality. The effect of elective single versus double embryo transfer was similar between the subgroups. However, the numbers of women who belonged to the older age group and received grade B quality embryos were smaller than their opposing subgroups, and this could explain the lack of a significant difference. Elective single embryo transfer significantly reduced the risk of preterm birth and low birth weight, primarily because of fewer twins. The most appropriate method of reporting outcomes in IVF remains debatable, but many consider term singleton live birth to be a useful measure of describing positive consequences of IVF—that is, offspring who are likely to be healthy at birth.34 We found that the chances of delivering a healthy newborn (term singleton birth) after elective single embryo transfer were higher than those after double embryo transfer. On the other hand, double embryo transfer (because of the higher risks of twins), increased female BMI, and prolonged duration of infertility were associated with very preterm births (≤32 weeks). Our review should be useful in informing decision making regarding the number of embryos to transfer in IVF. Live birth rates after elective single embryo transfer are high in women with a profile similar to that in the trials included in this systematic review, and a further increase (by means of double embryo transfer) is associated with high rates of preterm birth and low birthweight babies caused by twin pregnancies. Given the opportunity for replacing a single frozen thawed embryo in a subsequent cycle, elective single embryo transfer should thus be the default position.38 It must be emphasised that as nearly all couples recruited to the trials included in this analysis had a good prognostic profile, the results of our meta-analysis are valid only for this group. The entry criteria in these trials ensured that most participants were young, and we were unable to establish the impact of unfavourable prognosticators such as increased female age. When a strategy of elective single embryo transfer is applied in couples with poorer prognosis (for example, in older women), we cannot rule out the possibility that the cumulative live birth rate could shift in favour of double embryo transfer. Further trials of elective single versus double embryo transfer should focus on women with different prognostic profiles, such as older women. In addition, existing national databases should be examined to identify which women and embryos could benefit from a policy of single embryo transfer. Although costly and time consuming compared with aggregated data meta-analysis, meta-analysis of individual patient data allows the most definitive synthesis of available data and should be promoted in research in reproductive health. We thank all authors of the original published trials. Gerris trial: Jan Gerris, Diane de Neubourg, Kathelijne Mangelschots, Eric Van Royen, Muriel Van de Meerssche, and Marion Valkenburg; Lukassen trial: H G M Lukassen, D D Braat, Alex M M Wetzels, Gerhard A Zielhuis, Eddy M M Adang, Eduard Scheenjes, and Jan A M Kremer; Martikainen trial: Hannu Martikainen, Aila Tiitinen, Candido Tomás, Juha Tapanainen, Mauri Orava, Leena Tuomivaara, Sirpa Vilska, Christel Hydén-Granskog, Outi Hovatta, and the Finnish ET Study Group; Thurin trial: Ann Thurin, Jon Hausken, Torbjörn Hillensjö, Barbara Jablonowska, Anja Pinborg, Annika Strandell, and Christina Bergh; Van Montfoort trial: Aafke PA van Montfoort, Audrey A A Fiddelers, J Marij Janssen, Josien G Derhaag, Carmen D Dirksen, Gerard A J Dunselman, Jolande A Land, Joep P M Geraedts, Johannes L H Evers, and John CM Dumoulin. We also thank J Wang (ASSET trial) and S Keay, R Gazvani, Y Sajjad, H Lyall, M Jamieson, V Sandison, and P Braude (ECOSSE trial), Maureen Porter for her significant contribution to the ECOSSE trial, and all participants of the original trials that provided the data for this systematic review. Contributors: SB and BWM conceived the idea for the review. KH with SB and BWM developed the protocol with input from all the authors. KH and SB carried out literature searches and retrieved the identified papers. BWM acted as the third reviewer if consensus could not be reached between KH and SB. KH developed the master database and performed the initial statistical analysis. DJMcL developed the master database, performed the statistical analysis, and wrote the initial draft of the manuscript and all subsequent drafts with input from all coauthors. DJMcL is guarantor. All authors had full access to all of the data and can take responsibility for the integrity of the data and the accuracy of the data analysis. Funding: This review was funded by the Wellcome Trust (Research Leave award for SB). The study funder did not participate in study design; in the collection, analysis or interpretation of data; in the writing of the report; or in the decision to submit the paper for publication. All researchers were independent from the funder. Competing interests: All authors have completed the Unified Competing Interest form at www.icmje.org/coi_disclosure.pdf (available on request from the corresponding author) and declare: no support from any organisation for the submitted work apart from the funding from the Wellcome Trust (mentioned above); MJD received a research grant from the National Health and Medical Research Council, DdeN is secretary of the VWRG (Reproductive Medicine subgroup of the Flemish Gynaecological society) and received travel and accommodation sponsored by Schering-Plough for the 6th world congress on ovulation induction; with the exception of DJM, KH, BWM, and AMvanP, all authors were involved in the conduct of the primary randomised trials included in this systematic review. Ethical approval: Advice regarding ethical approval to conduct this meta-analysis was sought from the local ethics committee of the centre (Aberdeen) where IPD analysis of anonymised data was performed. The North of Scotland Research Ethics Service deemed that a formal ethics application was unnecessary. Where necessary, local ethics approval to share anonymised trial data was obtained by participating trial groups. Bergh C. Single embryo transfer: a mini review. Hum Reprod2005;20:323-7. Gerris JM. Single embryo transfer and IVF/ICSI outcome: a balanced appraisal. Hum Reprod Update2005;11:105-21. Thurin Kjellberg A, Carlsson P, Bergh C. Randomized single versus double embryo transfer: obstetric and paediatric outcome and a cost-effectiveness analysis. Hum Reprod2006;21:210-6. De Mouzon J, Goossens V, Bhattacharya S, Castilla JA, Ferraretti AP, Korsak V, et al, and The European IVF-monitoring (EIM) Consortium, for the European Society of Human Reproduction and Embryology (ESHRE). Assisted reproductive technology in Europe, 2006: results generated from European registers by ESHRE. Hum Reprod2010;25:1851-62. Vilska S, Tiitinen A, Hyden-Granskog C, Hovatta O. Elective transfer of one embryo results in an acceptable pregnancy rate and eliminates the risk of multiple birth. Hum Reprod1999;14:2392-5. El-Toukhy T, Khalaf Y, Braude P. IVF results: optimize not maximize. Am J Obstet Gynecol 2006;194:322-31. Human Fertility and Embryology Authority. Multiple births and single embryo transfer review. 2009. www.hfea.gov.uk/530.html. Pandian Z, Bhattacharya S, Ozturk O, Serour G, Templeton A. Number of embryos for transfer following in-vitro fertilisation or intra-cytoplasmic sperm injection. Cochrane Database Syst Rev2009;2:CD003416. Thurin A. Elective single embryo transfer. [Dissertation.] Gothenburg University, 2005. Bhattacharya S. Efficacy and cost-effectiveness of selective single embryo transfer. 2006. www.controlled-trials.com/isrctn/pf/86466058. Roberts SA, Fitzgerald CT, Brison DR. Modelling the impact of single embryo transfer in a national health service IVF programme. Hum Reprod2009;24:122-31. Stewart LA, Tierney JF. To IPD or not to IPD? Advantages and disadvantages of systematic reviews using individual patient data. Eval Health Prof2002;25:76-97. Higgins JPT, Green S, eds. Cochrane handbook for systematic reviews of interventions. Version 5.0.2. Cochrane Collaboration, 2009. Liberati A, Altman DG, Tetzlaff J, Mulrow C, Gøtzsche PC, Ioannidis JPA, et al. The PRISMA statement for reporting systematic reviews and meta-analyses of studies that evaluate healthcare interventions: explanation and elaboration. BMJ2009;339:b2700. Simmonds MC, Higgins JPT, Stewart LA, Tierney JF, Clarke MJ, Thompson SG. Meta-analysis of individual patient data from randomized trials: a review of methods used in practice. Clin Trials 2005;2:209-17. Borenstein M, Hedges LV, Higgins JPT, Rothstein HR. Introduction to meta-analysis. John Wiley, 2009. Blake D, Farquhar C, Johnson N, Proctor M. Cleavage stage versus blastocyst stage embryo transfer in assisted conception. Cochrane Database Syst Rev2007;4:CD002118. Higgins JPT, Thompson SG, Deeks JJ, Altman DG. Measuring inconsistency in meta-analysis. BMJ2003;327:557-60. Holte J, Berglund L, Milton K, Garello C, Gennarelli G, Revelli A, et al. Construction of an evidence-based integrated morphology cleavage embryo score for implantation potential of embryos scored and transferred on day 2 after oocyte retrieval. Hum Reprod2007;22:548-57. Van Royen E, Mangelschots K, de Neubourg D, Laureys I, Ryckaert G, Gerris J. Construction of an evidence-based integrated morphology cleavage embryo score for implantation potential of embryos scored and transferred on day 2 after oocyte retrieval. Hum Reprod2001;16:326-32. Heijnen EMEW, Eijkemans MJC, De Klerk C, Polinder S, Beckers NGM, Klinkert ER, et al. A mild treatment strategy for in-vitro fertilisation: a randomised non-inferiority trial. Lancet2007;369:743-9. Gardner DK, Surrey E, Minjarez D, Leitz A, Stevens J, Schoolcraft WB. 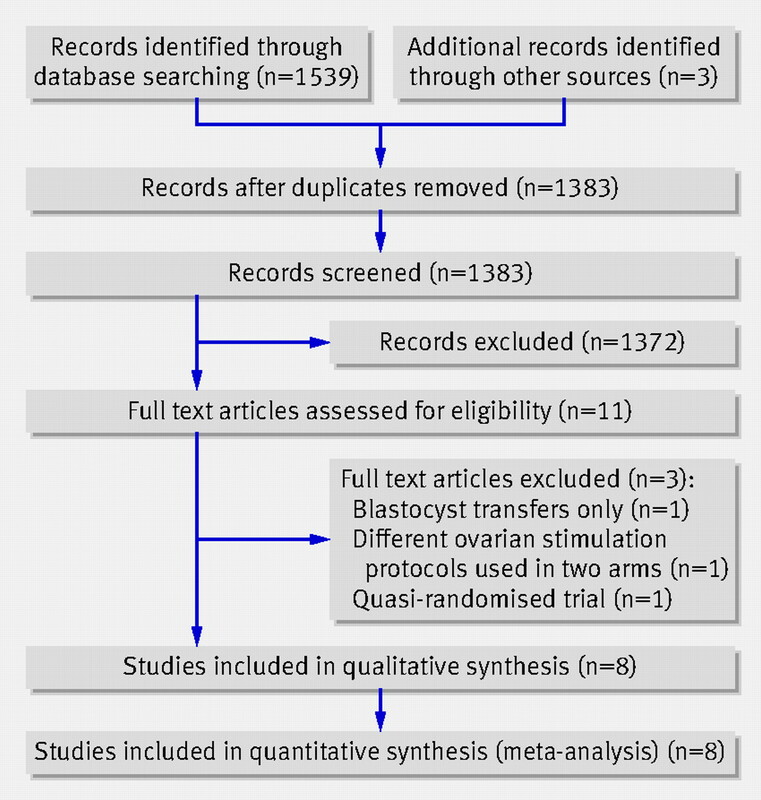 Single blastocyst transfer: a prospective randomized trial. Fertil Steril2004;81:551-5. Moustafa MK, Sheded SA, El Aziz Mousta MA. Elective single embryo transfer versus double embryo transfer in assisted reproduction. Reprod Biomed Online2008;17:82-7. Thurin A, Hausken J, Hillensjö T, Jablonowska B, Pinborg A, Strandell A, et al. Elective single-embryo transfer versus double-embryo transfer in in vitro fertilization. N Engl J Med2004;351:2392-402. Lukassen HG, Braat DD, Wetzels AM, Zielhuis GA, Adang EMM, Scheenjes E, et al. Two cycles with single embryo transfer versus one cycle with double embryo transfer: a randomized controlled trial. Hum Reprod2005;20:702-8. Van Montfoort AP, Fiddelers AA, Janssen JM, Derhaag JG, Dirksen CD, Dunselman GAJ, et al. In unselected patients, elective single embryo transfer prevents all multiples, but results in significantly lower pregnancy rates compared with double embryo transfer: a randomized controlled trial. Hum Reprod2006;21:338-43. Gerris J, de Neubourg D, Mangelschots K, Van Royen E, Van de Meerssche M, Valkenburg M. Prevention of twin pregnancy after in-vitro fertilization or intracytoplasmic sperm injection based on strict embryo criteria: a prospective randomized clinical trial. Hum Reprod1999;14:2581-7. Martikainen H, Tiitinen A, Tomás C, Tapanainen J, Orava M, Tuomivaara L, et al. One versus two embryo transfer after IVF and ICSI: a randomized study. Hum Reprod2001;16:1900-3. Lyman GH, Kuderer NM. The strengths and limitations of meta-analyses based on aggregate data. BMC Med Res Methodol2005;5:14. Gelbaya TA, Tsoumpou I, Nardo LG. 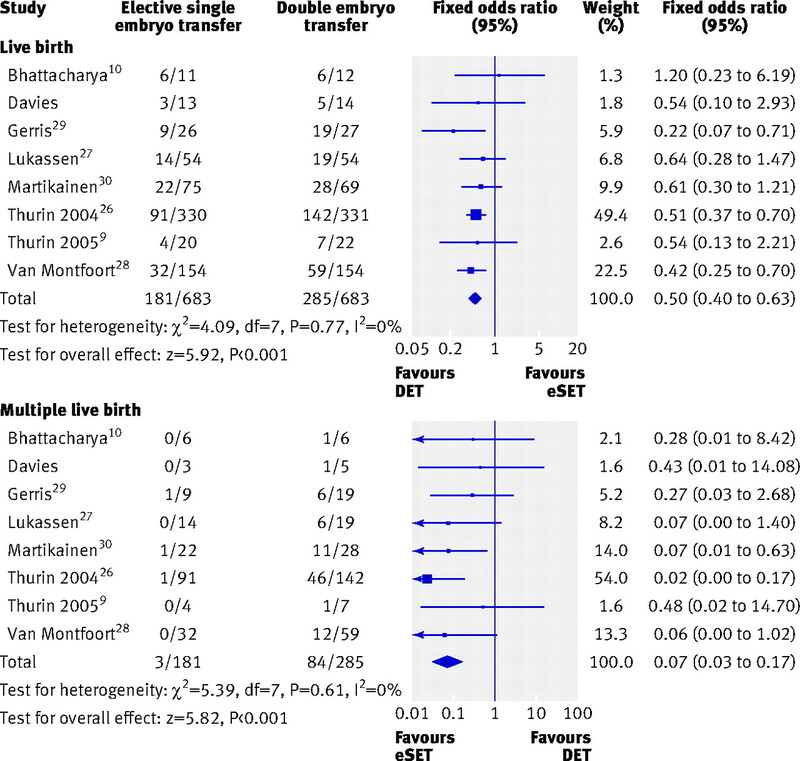 The likelihood of live birth and multiple birth after single versus double embryo transfer at the cleavage stage: a systematic review and meta-analysis. Fertil Steril 2010;94:936-45. Min JK, Breheny SA, MacLachlan V, Healy DL. What is the most relevant standard of success in assisted reproduction? The singleton, term gestation, live birth rate per cycle initiated: the BESST endpoint for assisted reproduction. Hum Reprod2004;19:3-7. Karlström PO, Bergh C. Reducing the number of embryos transferred in Sweden—impact on delivery and multiple birth rates. Hum Reprod2007;22:2202-7. Källén B, Finnstrom O, Lindam A, Nilsson E, Nygren KG, Olausson PO. Blastocyst versus cleavage stage transfer in in vitro fertilization: differences in neonatal outcome? Fertil Steril2010;94:1680-3. Papanikolaou EG, Camus M, Fatemi HM, Tournaye H, Verheyen G, van Steirteghem A, et al. Early pregnancy loss is significantly higher after day 3 single embryo transfer than after day 5 single blastocyst transfer in GnRH antagonist stimulated IVF cycles. Reprod Biomed Online2006;12:60-5. Veleva Z, Karinen P, Tomas C, Tapanainen JS, Martikainen H. Elective single embryo transfer with cryopreservation improves the outcome and diminishes the costs of IVF/ICSI. Hum Reprod2009;24:1632-9. Porter M, Bhattacharya S. Investigation of staff and patients’ opinions of a proposed trial of elective single embryo transfer. Hum Reprod2005;20:2523-30. Ryan GL, Zhang SH, Dokras A, Syrop CH, van Voorhis BJ. The desire of infertile patients for multiple births. Fertil Steril2004;81:500-4. Maheshwari A, Griffiths S, Bhattacharya S. Global variations in the uptake of single embryo transfer. Hum Reprod Update2010 July 15, epub ahead of print. Murray S, Shetty A, Rattray A, Taylor V, Bhattacharya S. A randomized comparison of alternative methods of information provision on the acceptability of elective single embryo transfer. Hum Reprod2004;19:911-6. Ryan GL, Sparks AET, Sipe CS, Syrop CH, Dokras A, van Voorhis BJ. A mandatory single blastocyst transfer policy with educational campaign in a United States IVF program reduces multiple gestation rates without sacrificing pregnancy rates. Fertil Steril2007;88:354-60. Min JK, Claman P, Hughes E. Guidelines for the number of embryos to transfer following in vitro fertilization. Int J Gynecol Obstet2008;102:203-16. Templeton A. Avoiding multiple pregnancies in ART. Replace as many embryos as you like—one at a time. Hum Reprod2000;15:1662.